Enroll in #EmTechMOOC to earn a Coursera Certificate of Completion and digital badges. Share your accomplishments with others through your personal online portfolio, your resume, and social networks to signify your accomplishments and show your progress toward being a lifelong learner. In a case study published by EDUCAUSE, a digital badge is defined as a symbol or indicator of an accomplishment, skill, quality, or interest (Knight & Casili, 2012). Badges are also often referred to as micro-credentials. Consider traditional badges issued by organizations such as the Girl Scouts of the United States of America; each badge/patch is a visual representation of an accomplishment or skill. On the surface, a badge seems to just be a pretty picture. Beneath the surface, a badge is more complex. What makes a digital badge unique is the data packed inside the badge. 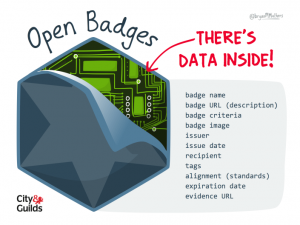 The image of an open digital badge, created by Bryan Mathers, shows the information contained in digital badges. A digital badge is comprised of several parts, including the image, the earner’s personal information (making the badge unique to the user), and the evidence (a permanent connection to the accomplishment of the badge earner. This combination ensures that each badge is unique and a true representation of an earner’s accomplishment. Most badges are issued in an open badge format, meaning they are stored in a user’s online badge backpack; they can be transferred across different systems. The OpenBadges site has a good overview for anyone getting started with badging and includes information about earning, issuing, displaying and understanding badge awards. Badging is an emerging trend that offers a new way to represent skills and achievements that may be traditionally difficult to document. Badges help participants track their progress, encourage the completion of Discovery Exercises, and provide motivation to succeed in completing #EmTechMOOC. Badges are typically earned via “quests,” which are completed by badge earners. Badge earners interact with a variety of materials, ultimately producing a learning object to demonstrate their knowledge of the content. Generally, these learning objects must then be approved by the moderators of the quest, who authorize and issue the badge. This video from the MacArthur Foundation explains what a badge is and its benefits. It also includes examples of their use within education. A key message shared in the video is that, “Badges are a new idea to recognize the learning that happens anywhere and share it in the places that matter.” Watch the following video, “What is a Badge?,” by the MacArthur Foundation (video length 3:36 min.). 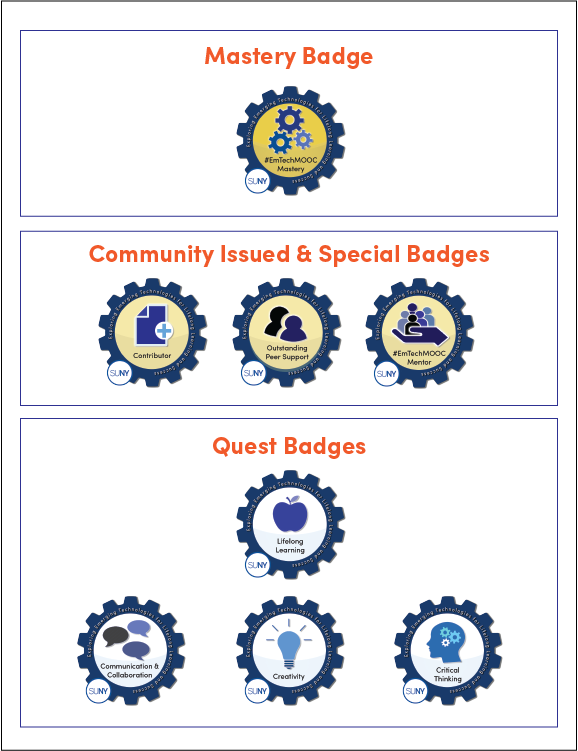 There are several types of badges, including Quest, Community Issued, Special Badges and Mastery Badges in #EmTechMOOC. Quest Badges are awarded for the completion of Discovery Exercises. Community Issued Badges are awarded for Outstanding Peer Support provided to other participants. The Outstanding Peer Support Badge is awarded by the #EmTechMOOC Community through a peer-voting process to the top 3 participants in each Coursera cohort. Special Badges are awarded for Contributing to EmTechWIKI. These special badges are optionally earned by any MOOC participant who added a new tool or resource to the EmTechWIKI collection. In addition, Mentor Badges are able to be earned by anyone who completes the MOOC who would like to become mentors in subsequent sessions. If you are interested to become an #EmTechMOOC mentor, contact the #EmTechMOOC team. submit a summary post reflecting on your learning journey and your experiences in this MOOC. Instructions about how to claim and share your badges on your social media networks are available on the Credly website. Also, see below for additional information. Go to your Credly page (you can click the link on the email that tells you that you have received your badge, Sign In, and then click on My Credit). Select the badge by clicking on it. Click See More. Once the badge page is opened, you can click on Share and then click Download. You can download your Printable Certificate (a printable PDF file). This first section applies to Digication, the recommended ePortfolio platform for #EmTechMOOC. Go to your ePortfolio editor page on Digication, click the plus sign (+) to add a content module to your ePortfolio. Once you are logged in, you can see your available badges. Click on the ones you want to embed and then click Add Module. Go to your Credly page (you can click this link on the email that tells you that you have received your badge, register/log in, and then click on My Credit). Once the badge page is opened, you can click on Share and then click Copy to copy the embed code or the share a link so you can embed them directly in your website. You can also click Download and then click Download Badge, in case you want to save a copy of it or include it in a document such as your email signature or your resume/CV. Go to your Credly page (you can click the link in the email that tells you that you have received your badge, Sign in, and then click on My Credit). Once the badge page is opened, you can click on Share and then click on the social media icons (Linkedin, Facebook, Twitter, etc.). Your badge will appear automatically if you link your social media account. For Linkedin, you can also click Add to Profile to Add Your Credit to Linkedin as a Certification. Click the icon Add to Profile, which will open a new window to your Linkedin account. Then, copy and paste all of the credential information into the window that opens from LinkedIn. (Note: to have the SUNY logo display with your badge you need to change the information for the Issuing Organization to be The State University of New York.) Your badge will then appear in your Certification section on Linkedin. Once you complete all the modules in #EmTechMOOC in Coursera, you will also get a Verified Coursera Certificate of Completion. This is also printable and able to be added to your Linkedin Certifications.